Are you leaner, faster, stronger than you were last year? If not, then maybe your workout program needs a change. After all, doing the same program month after month and year after year won’t increase your fitness level and can lead to diminishing returns. Increased fitness comes from OVERLOAD. Overload refers to putting a higher load or resistance on body than is normal or routine. Overload creates good stress to the body which then requires a response or change. The change or response is increased lean muscle, stronger joints, greater cardio-vascular and lung capacity and much more. Gradual overload can be done using the FITT-VP principle. Examine your workout program to utilize overload along any of these 6 parameters for improved fitness. Play around with one or two of these components at a time to get fitter! 1. Vary the intensity, time or ramp/resistance on your favorite cardio machine. Or split your cardio time on different machines. Try a Concept 2 rower or upper body cycle or SkiErg machine for cardio from the upper body down. Play a team sport or set a goal for a 5K or obstacle challenge with friends. 2. Use bands and dumbbells instead of fixed-plate seated machines. 3. Take a new group training class. If you only do Yoga then try KINSTRETCH, weights or cardio class. 4. Hire a trainer for a great workout or purchase a written workout program with progressions. You can get a new phased workout program each month in your inbox for golf, mobility, strength, speed protocols, etc. Contact me for details. 5. Progress some aspects or completely change your workout every 4 – 6 weeks to ensure you are progressing and hitting various energy system training. 6. 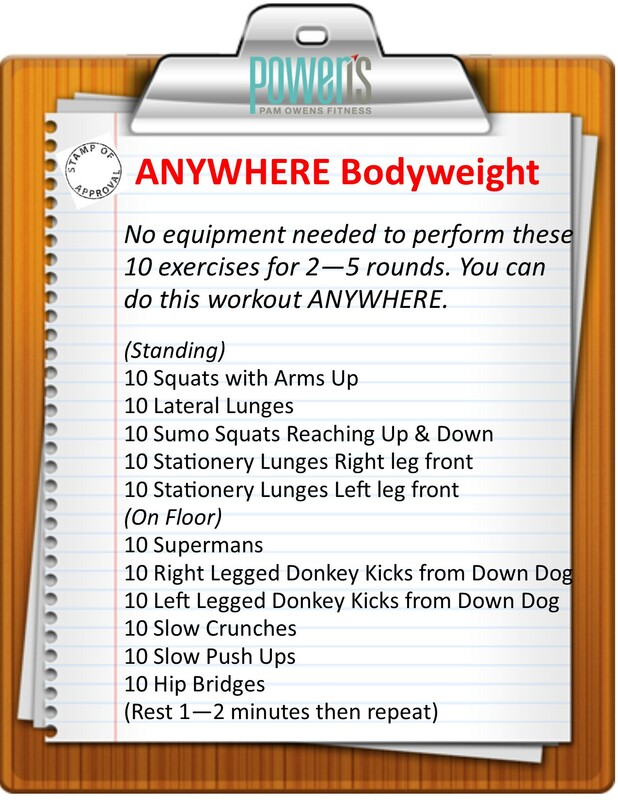 Change the setting of your workouts from home to gym or park or vice versa. By changing the setting you’ll be doing different exercises in new ways. Here’s a great ANYWHERE bodyweight workout for you to use this summer . . . If you are over 55, have any medical concerns or injuries, please consult your physician before changing any of these parameters. If you have any questions, please feel free to contact me.